Identify and interact with your colleagues using user people profiles. Contact details are clearly displayed on user profiles and can be created as links, allowing users to directly connect to colleagues. An easy to use, targeted search, accessible from any part of the site, ensures all users can quickly find the details of colleagues and contact information they need. Users can update their own detailed profiles, adding photos, organisational and skills information and a free text “About Me” section. Invotra provides each user with a unique user profile, detailing information about them and their position within the organisation. You can view information such as job roles, organisational skills, interests and much more. When viewing a profile the following information will be available. However, not all of this information will be available for every user, as some of it depends on the user adding and editing their own information. Contact details – Prominently displayed, in search results and on the full profile page, with the option of creating links to allow users to contact colleagues directly. Key skills – Invotra uses details entered in skills fields within a profile to create and display similar users. 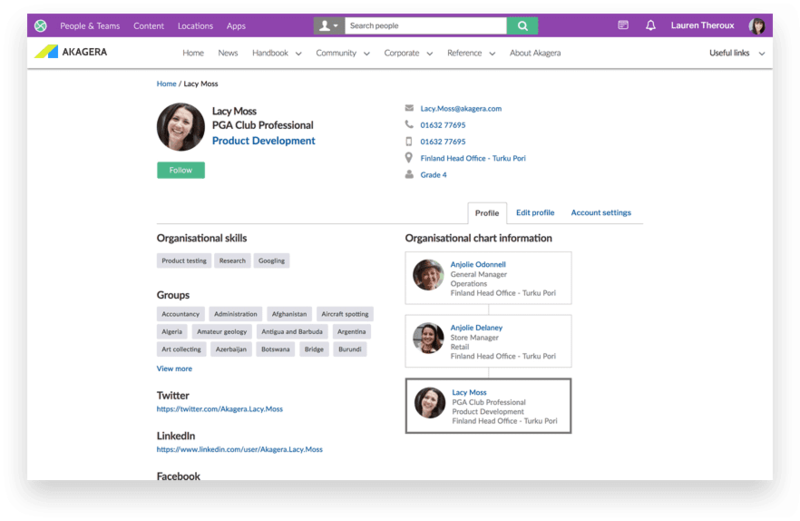 Profile links – A user’s name is displayed as a link across teams, locations and content, to allow communication throughout the whole intranet. Compatible with most existing HR systems – Invotra directories allow simple transfers from an existing directory or people finder to your Invotra People. Search – Profile searches are targeted and all profile text is fully searchable. If required, searches can also be customised by site managers to only display required information.